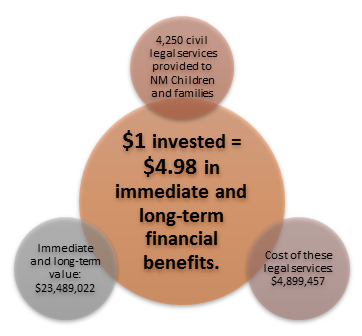 Civil legal services for low income children and families have an enormous impact and are cost-effective. Fiscal year that ended June 30, 2014. The UNM Law School has received a grant to attract, prepare and mobilize a diverse group of lawyers to pursue justice and racial equity and to achieve improved health and well-being for New Mexico’s most vulnerable children and families – those marginalized by race, ethnicity, socioeconomic or other critical disparities. The project, funded by a $2,652,487 grant from the W.K. Kellogg Foundation (WKKF), is a collaboration with strategic community partners, including UNM’s Health Sciences Center (HSC), to address unmet legal needs that harm the health and well-being of children and families living in poverty in New Mexico. In May 2014, the UNM Law School received a grant from WKKF to plan the initiative. That effort was led by Emerita Professor Barbara Bergman, Corinne Wolfe Children’s Law Center Director & Senior Attorney Beth Gillia, and Associate Professor of Law Yael Zakai Cannon. The planning involved the formation of a statewide advisory committee and focus groups from communities across New Mexico. The new project is headed by the UNM Law School’s Corinne Wolfe Children’s Law Center, which has been renamed the Corinne Wolfe Center for Child and Family Justice to reflect the Center’s vision of a just and equitable New Mexico in which all children are safe, healthy and educated, and can build on the strength of their families and communities to thrive. “Well-trained lawyers who reflect the diversity of our state can bring lasting change to New Mexico’s children and families by using legal and policy advocacy to address the social and legal determinants of health, such as environmental conditions, family stability, immigration, economics, access to education and health and mental health services,” Gillia adds. There is an enormous gap in access to justice for New Mexico’s low income children and families. 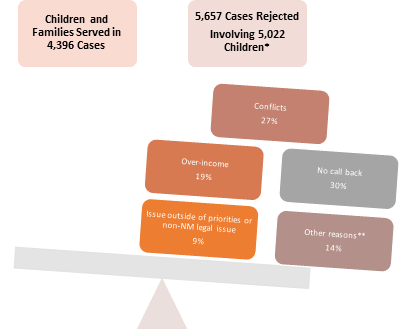 *Number of children in rejected is cases is a projected number. **Other reasons include parties that decided not to continue, 3rd-party callers, parties already represented and seeking 2nd opinion, and non-NM residents. “The impact of the project will be more public interest lawyers, better representation and ultimately, improved health and well-being for New Mexico’s children and families in poverty,” says Alfred D. Mathewson, dean of the UNM Law School. “The new Center for Child and Family Justice will allow the UNM School of Law to attract, prepare and deploy across New Mexico a diverse group of attorneys to deliver the highest quality of public interest lawyering, providing critical access to justice for our state’s neediest children and families, who often lack access to critical legal services,” adds Sergio Pareja, dean of the UNM Law School. “The partnership between the Health Sciences Center and the law school means families with health-harming legal needs have access to legal advice and representation to resolve complicated social determinant issues and to achieve better health and justice outcomes,” says Paul B. Roth, MD, UNM chancellor for health sciences. Pediatrician Andrew Hsi, MD, a professor in the UNM School of Medicine, helped create the state’s first Medical Legal Alliance at UNM, the foundation for the growing partnership between the law school and the Health Sciences Center. Hsi is the leader of the HSC Institute for Resilience, Health and Justice and will have a leadership role in the Center for Child and Family Justice. enhance the ability of students and professionals from health/other disciplines to identify social determinants of health/well-being and to collaborate with attorneys to ameliorate their impact.